After fifty years of awards ceremonies by TAG and its predecessor, MAG, the Theatre Arts Guild is starting a new annual tradition in August to celebrate the theatre community as a whole and acknowledge the great stage work being done throughout the area. 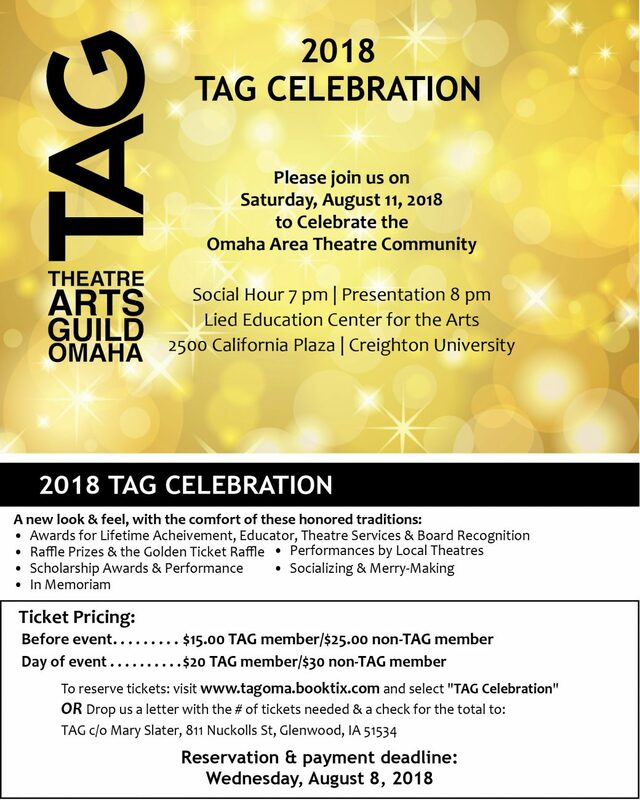 The TAG Celebration 2018 will be held on August 11, 2018 at the Lied Education Center for the Arts on the campus of Creighton University. The theater awards portion of the annual event has been dropped in order to celebrate the hard work everyone has put into theater productions over the past year. However, much of the rest of the evening will be familiar to anyone who has attended previous events. Attire will be the same as the past, ranging from formal to cocktail formal to more casual dress. There will be a social hour in the Lied Center lobby at 7 pm with a cash bar (no hors d’oeuvres this year), followed by a presentation in the mainstage theatre at 8 pm. – Performances by local theatres throughout the program. – President’s address and introduction of new TAG board members. – And, of course, the winners of all the raffle prizes, including the coveted “Golden Ticket,” which entitles the winner to free admission to productions at participating theaters for the 2018-2019 season. The awards committee estimates that this part of the celebration will run approximately ninety minutes. Following the presentation, the celebration will move back out into the Lied Center lobby for drinks until the bar closes at 10:30. This will give everyone more of a chance to mingle again after the event. There are rumors of a subsequent after party as well. No worries about parking: Parking is available in the visitor lot in front of the Lied Center building, although the younger, more mobile celebrants are encouraged to park on the surface lot located on the east side of 24th Street, just north of the theatre. That lot is typically a faculty lot, but it will be open to visitors for the TAG Celebration. There should be street parking along Cass Street to the south of the Lied Center as well. Come be a part of a new TAG tradition and celebrate an outstanding season of theater! The TAG Celebration 2018 will be on August 11, 2018, with a social hour at 7 pm, and the presentation at 8 pm. The Lied Education Center for the Arts is located at 2500 California Plaza, on the Creighton University campus. Advanced reservations are available up until Wednesday, August 8, 2018, at: www.tagoma.booktix.com (and select “TAG Celebration”). Reserved ticket prices are $15.00 for TAG members and $25.00 for non-TAG members. Tickets can also be purchased by cash or check ONLY at the door the night of the TAG Celebration. Day of ticket prices are $20.00 for TAG member and $30.00 for non-TAG members. Questions? You can contact this year’s Celebration Co-Chairs, Katie Cameron, Lara Marsh, and Shea Saladee at celebration@theatreartsguild.com.